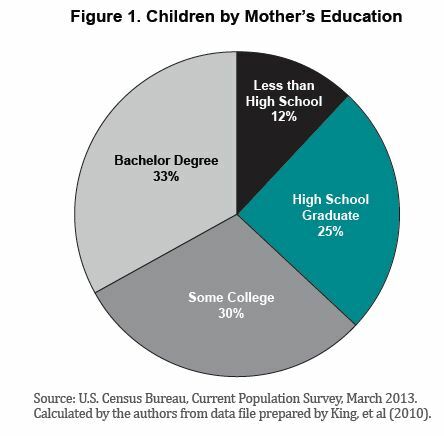 This page was retrieved from https://www.fcd-us.org/mothers-education-and-childrens-outcomes-how-dual-generation-programs-offer-increased-opportunities-for-americas-children/. Mother’s Education and Children’s Outcomes: How Dual-Generation Programs Offer Increased Opportunities for America’s Children is the second in a series of the Foundation for Child Development’s Disparities Among America’s Children reports. It offers the first-ever analysis of economic, education, and health indicators for children whose mothers have not graduated from high school, compared to children whose mothers have higher levels of education. The enormous disparities in well-being identified point toward the value and need for comprehensive Dual-Generation strategies that offer high-quality PreK-3rd education for children, effective job training for parents that leads directly to well-paid work, and additional public services — such as health, nutrition, food, and housing — which enable low-income families to overcome barriers to success. Mother’s Education and Children’s Outcomes identifies federal, state, and local policy solutions to reduce these disparities.